*Disclosure: This is in partnership with Nutrisystem who has provided the program, free for three months. All opinions are of my own, your opinion may vary. Today I start week five. In one month, including the first week which was the fast five, I have lost a total of 14 pounds!!! So stoked and seeing those numbers continue to go down is enough motivation for me! My face is usually the first place that I seem to lose those chubby cheeks! 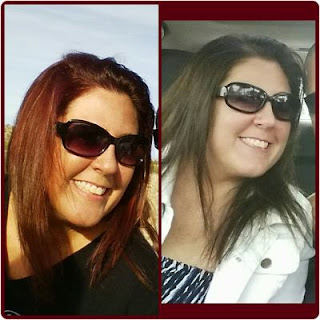 In the picture above - can you tell which one is before and which one is after the 14 pound loss? While I don't get out much, especially since I work at home, I remember my first compliment came from my husband. He told me how proud he was of me for sticking to the program and could see it not only in my face, but my attitude as well. I was not so tired all the time, more active and seemed more happy all around. It's really boosted my self esteem and kept me going and I am so excited to see with month two brings.....or should I say I'm excited to see what disappears! lol! Doesn't that look bomb! It was so good and yes, I was already thinking Thanksgiving - this will be an awesome alternative. 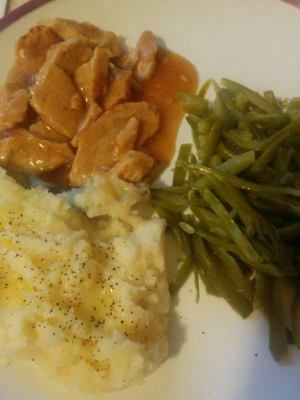 The turkey and mashed potatoes is the Nutrisystem provided meal for dinner. I added some green beans and my self a tasty, filling dinner. If you have never had Nutrisystem before, the first month is all about exploring their food - finding out what you do and do not like. That way when you are ready for your second order, it will make it all that much easier and will help you get through the month, knowing the food is good and exactly what you were looking for. I am a huge chocolate fan, so was nervous as Halloween approached. I made sure to get out a bag of Nutrisystem chocolates as everyone sat around and went through their candy, helped me stay focused and not go off path and all while not being left out as well. As far as exercise goes, week two and three I would speed walk on my treadmill and do some weight lifting. Last week I started a 5K running program to help get me in shape to run my first 5K. I walk for four minutes and ran the fifth minute, repeating four times. This week, I will step it up a bit. I have started looking around in my community for walks / runs to become involved in. I found a fun one that the whole family can do in our PJ's looking at Christmas lights!! The kids are excited and it's a great way for the whole family to get involved and stay active! So, did you guess what picture is before? The picture of me in the white jacket is the before pic, the other was just recently over Halloween where we went to a local corn maze. That was the first picture I saw of myself where I said - hey! I can see the weight loss! Well...here's to month two! Follow me along my journey and I hope I can encourage others! !